David Huang invested over $100,000 in his IS 300 and it shows. Dubbed the “IS 1000,” this Lexus SEMA Showcase winner features an estimated 1,000-horsepower engine, custom color-shift Midnight Purple paint, custom body and frame work and custom suspension. This isn’t your average IS Convertible. 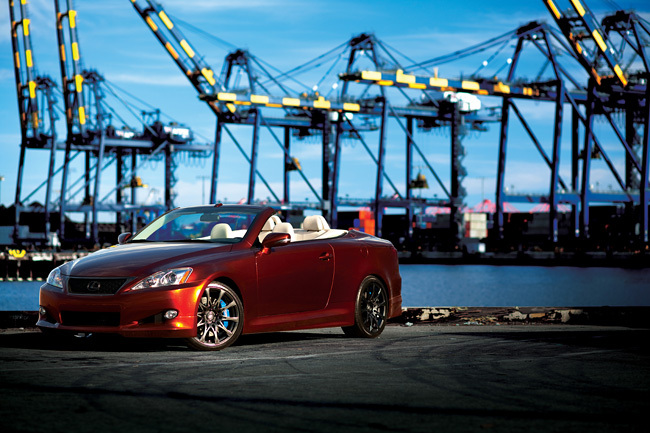 It’s 0-60 Magazine’s IS Coupe, a more aggressive, performance-enhanced luxury two-door. 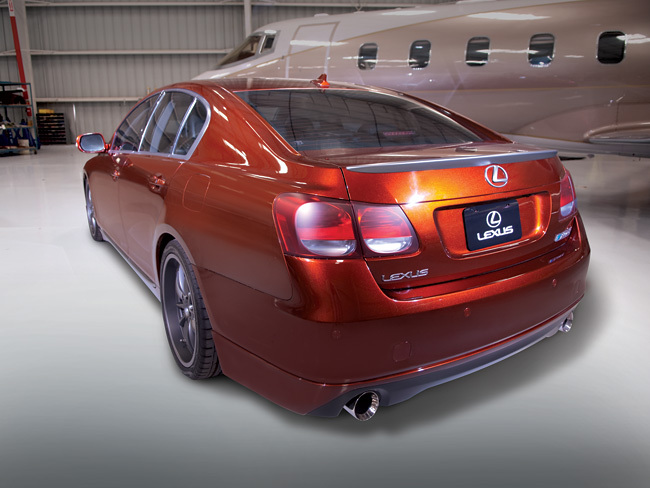 While many custom-car builders prefer extreme designs, VIP Auto Salon and JTuned.com took a more subtle approach with their IS 350 C. Requiring approximately $15,000 and about one and one-half months of hard labor, the Matador Red IS C features a carbon-fiber hood, carbon-fiber trunk spoiler, a high-performance exhaust system, and custom tires and wheels..
It’s not everyday you see an IS 350 C sporting “Foxy Green” paint and a Seibon carbon-fiber rear wing—unless you happen to be Brian Fox of Fox Marketing. With custom IS F front fenders and side skirts, accented with custom black performance wheels by iForged Sprint, this is one IS C that refuses to be ignored. As if gracing this IS 350 C with every F-Sport accessory available wasn’t enough, Toyota Racing Development (TRD) took it to the next level with a Vibrance Orange Glow candy paint job and ground effects by Five Axis. Toyota Racing Development (TRD) pushed their GS 350 to the limits, loading it up with virtually every F-SportTM performance accessory available, including an F-Sport lowering spring set and F-Sport performance brakes. Also featured: a four-piece ground effects kit and grille insert by Five Axis and a three-stage Vibrance Orange Glow candy paint job to match their IS C F-Sport. 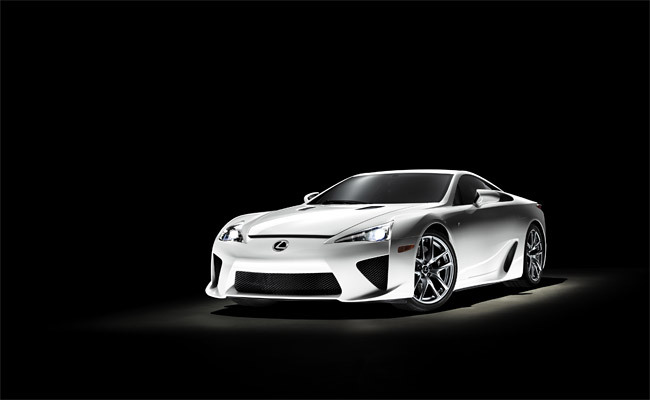 The first Lexus supercar, the LFA serves as the flagship for the F portfolio of Lexus performance models and redefines the supercar for the 21st century. 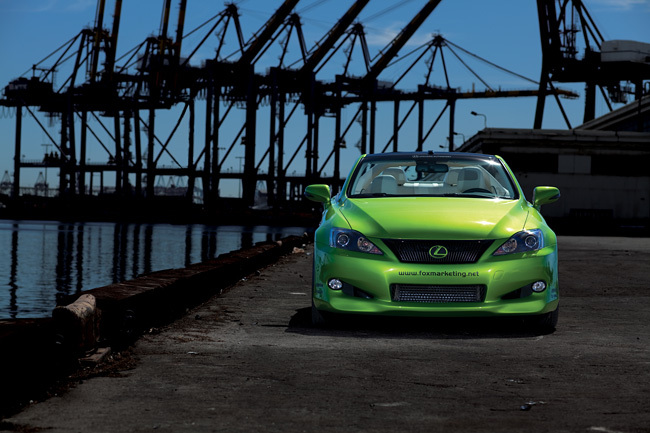 The Lexus F brand complements the core Lexus DNA by emphasizing serious performance. The LFA was carefully developed from a blank canvas by a small and dedicated team of hand-picked engineers that pushed every possible dynamic boundary. All 500 LFA supercars will be hand-assembled by skilled technicians in the “Lexus LFA Works” at the Motomachi Plant in Toyota City at a rate of no more than 20 per month.